Francis grows up in Alameda in Oakland, California. He serves as a pilot in WWI and reaches the rank of lieutenant. After the war he works as a stenographer for the American Red Cross, and in that capacity applies for a passport in 1919 for a journey to Siberia, which will also take him to Japan, China, Manchuria and Russia. The war department approves. Francis’ signature on his passport application in 1919. His language is still Swedish. He is 6 feet 1 inch tall, has blue-gray eyes and light brown hair, and at least before his Siberian journey he is said to have a sunburned complexion. 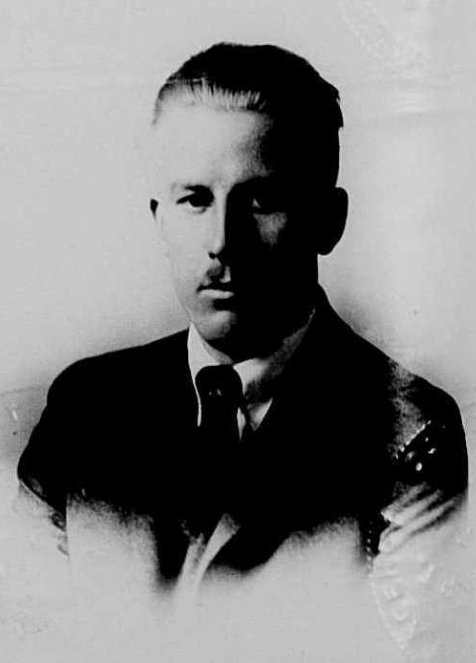 Francis Nunenmacher’s picture on the passport application 1919. Source: Familysearch.org. His mother dies while he is away, and on his return he takes up work as an advertiser in farming. He and his sister then move in with their father’s sister Louise C. Marvin in Berkley. Two years later, in the summer of 1921, Francis is killed tragically in a flight accident during training in Berkley along with his co-pilot Captain McCrae. icon-camera portrait (ca. 1919). Source: Familysearch.org. Etiketter: Nunenmachersläkten, porträtt, samtida beskrivningar, utvandrare. Lägg till bokmärke.